"I﻿﻿﻿﻿﻿﻿ took the time to research the steps you need to follow to﻿ ﻿successfully rent ﻿your﻿ first ﻿﻿apartment﻿﻿. With ﻿6 instructional lessons ﻿in almost two hours, I am confident you will ﻿feel ﻿﻿empowered ﻿to tackle this﻿﻿ life﻿﻿ skill"﻿﻿﻿﻿﻿﻿﻿﻿﻿﻿. Lesson﻿﻿ ﻿﻿1: What is renting & can I afford it? Less﻿o﻿n ﻿﻿﻿2: How do I search for rental apartments? Lesson ﻿﻿﻿﻿﻿﻿﻿3: What are the costs associated in renting? ﻿﻿﻿﻿﻿﻿Lesson﻿﻿﻿ ﻿﻿﻿﻿﻿﻿﻿5﻿﻿: ﻿What's in your tenant lease agreement? This life skill is very necessary for your adult life because eventually you will leave your parents or guardians home. There are many responsibilities involved in living on your own. This course will help you in a way that is easy for you to understand so you can face this life skill with confidence. There are alot of information online and in print on renting an apartment or home. We compiled the most relevant information you need to rent your first apartment in a concise and easy to understand format. With solid knowledge on knowing how to search for vacant apartments, calculating costs, competently reading your lease agreement, protecting your personal property & much more...you will say...I can do this!! 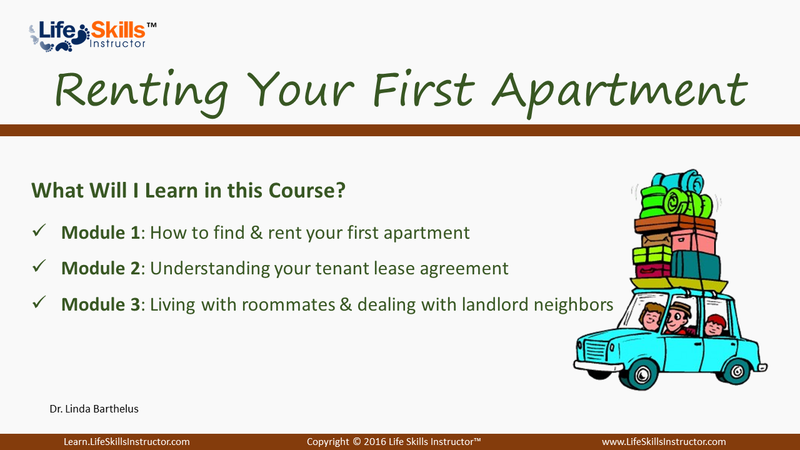 ​This is the first time I saw a course on how to rent an apartment...I watched 2 lessons, the one on qualifying for apartment and the other one talking about the tenant lease agreement, I have to say I learned some good info.